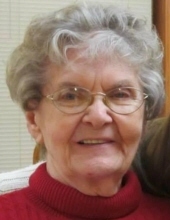 Marie Frances Gale, 92, formerly of Coralville, died Sunday, November 18, 2018 at Mercy Iowa City Hospice Unit. Marie resided at Solon Nursing Home for the past 6 years while living with Alzheimer’s disease. Visitation will be held Saturday, November 24th, from 9:00 to 10:30 am at St. Thomas More Catholic Church in Coralville. Funeral Mass will begin at 10:30 am at the church. A luncheon will follow in the church basement at 11:30 am. Graveside services are scheduled to begin that afternoon at 2:30 pm at St. Wenceslaus (Vaclav) Cemetery in Clutier, Iowa. Instead of flowers and plants, the family requests memorials be made to Alzheimer’s Research. Lensing Funeral & Cremation Service in Iowa City is handling arrangements. Marie was born January 9, 1926 in Tama County, near Chelsea, Iowa. Marie was the daughter of Joseph and Mayme (Stadler) Polka. She grew up in the Chelsea area, later moving with her family to Toledo. She attended rural schools and graduated from Toledo High School in 1943. Marie married Paul D. Sevcik on January 3, 1945 in Tama, Iowa. They farmed near Clutier. In 1952, Paul was seriously injured in a farm accident – passing away in 1963 at the VA Hospital in Iowa City. Marie married William E. Gale on October 3, 1964 in Iowa City. She worked at the VA Hospital and several nursing homes before her retirement. Marie also took pride in spending much time and effort caring for elders in their home. Marie enjoyed flowers and gardening, sewing and quilting, knitting and dancing. Both she and Bill enjoyed traveling and spending time with their family and friends. Marie was a wonderful grandmother and took great joy in caring for and spending time with her four grandchildren on a daily basis. Marie is survived by her sons, Craig Sevcik (Mary Ann) of Solon and Joe Gale (Casey) of Coralville; grandchildren, Delaney Keitel (Phil), Bailey Gale, Willey Gale and Josey Gale and one great grandson, Henry Keitel. Marie was preceded in death by her parents, her husbands, Paul and William and her two sisters, Mildred Hala and Marjorie Polka. "Email Address" would like to share the life celebration of Marie F. Gale. Click on the "link" to go to share a favorite memory or leave a condolence message for the family.